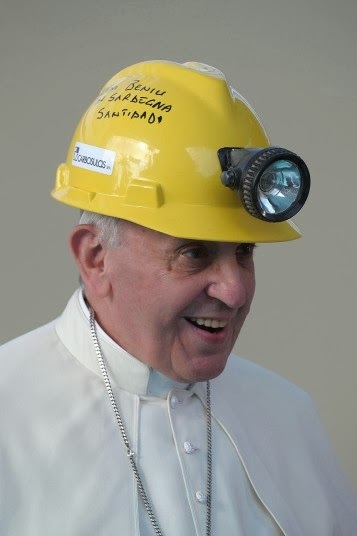 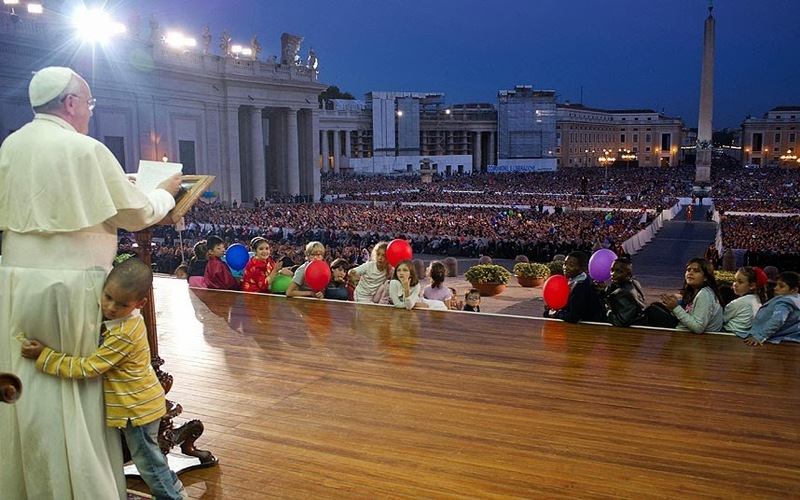 Vatican Pope Francis jokes with the newlyweds of the Rainbow Association Marco Lagulli Onlus, which deals with clownterapia (clown therapy) in hospitals, nursing homes, and orphanages. 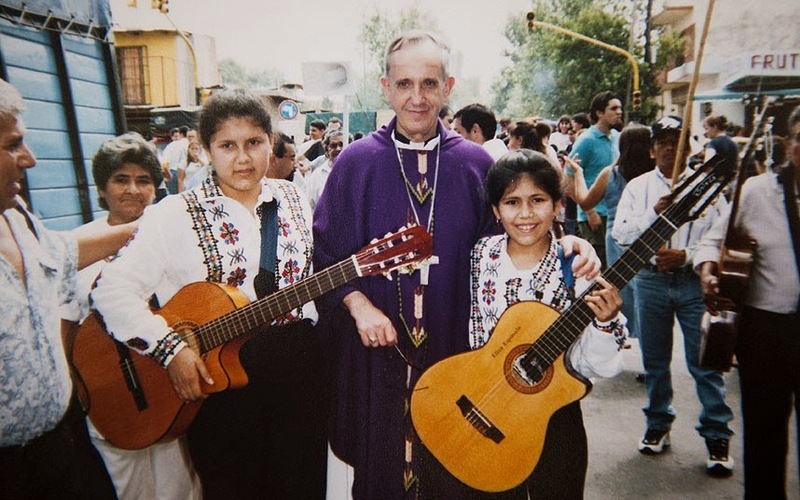 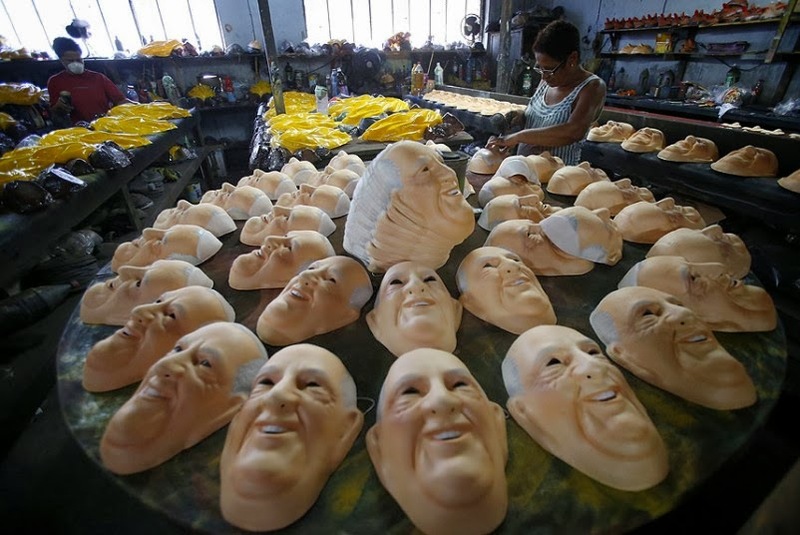 Buenos Aires' Archbishop Jorge Mario Bergoglio, now known as Pope Francis, poses for a photo with Angela Espinola, 12, left, and her sister Eliza, 9, during an Easter procession organized by the Virgin of Caacupe church in the Villa 21-24 slum in Buenos Aires, Argentina. Pope Francis hugs a man covered in neuronal tumours in Saint Peter's Square at the end of his General Audience in Vatican City. 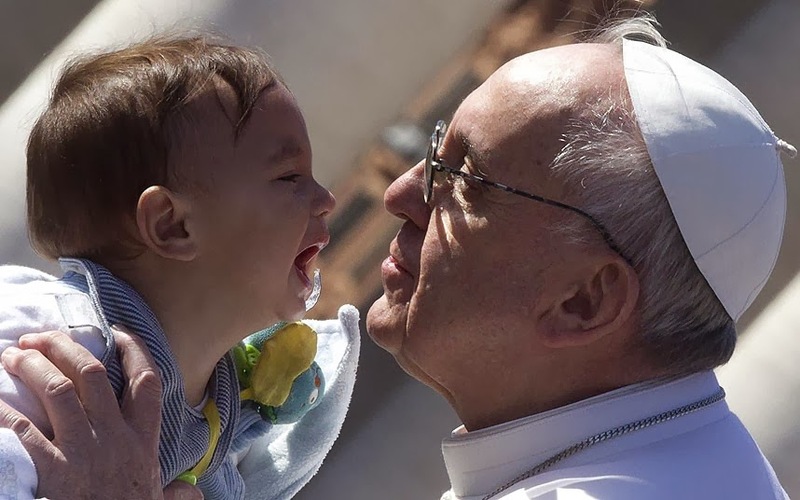 The ailment is genetic and not contagious. 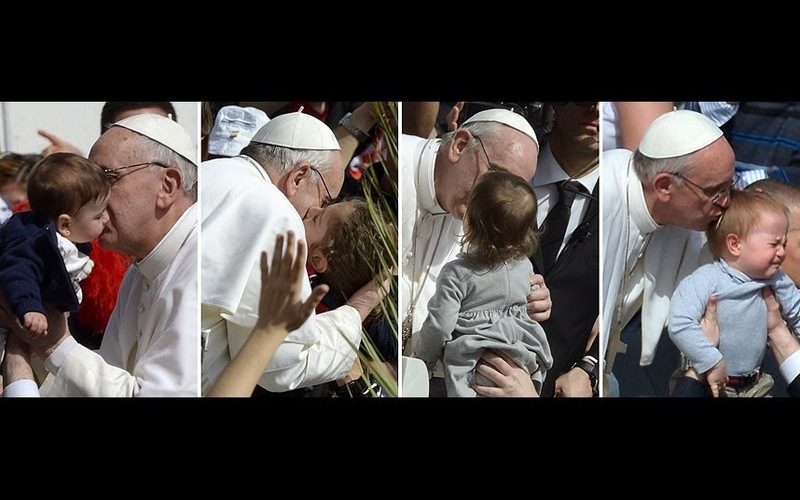 Pope Francis greets people during the general audience in St. Peter Square, Vatican City. 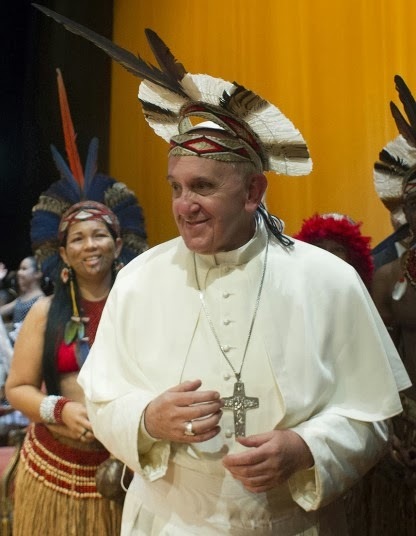 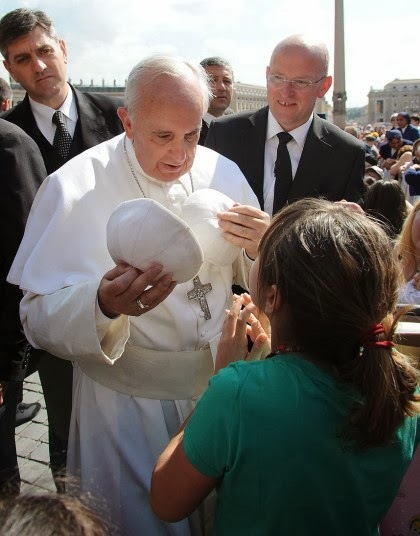 The Pontiff appeared to enjoy the exchange of caps with a girl from the faithful. 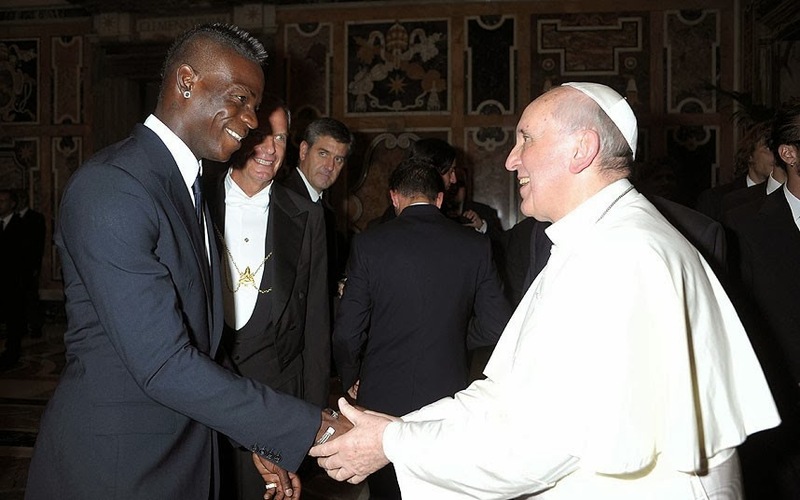 Pope Francis greeting Italian footballer Mario Balotelli during an audience at the Vatican. 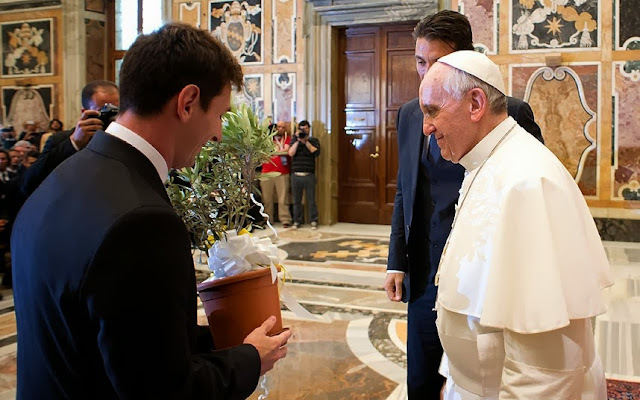 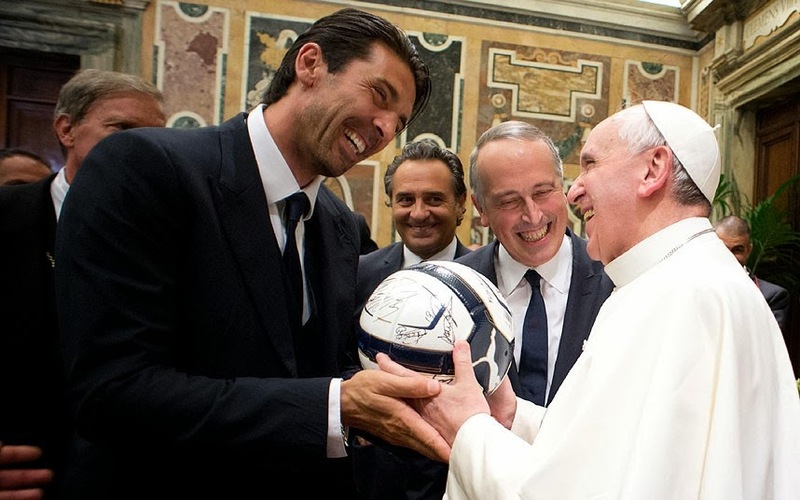 Pope Francis received the national soccer teams of Italy and Argentina ahead of a friendly international on 14 August in his honour at Rome's Stadio Olimpico. 'Frankly, it will be difficult for me to root for one team,' the Pope, who was born in Argentina from a family of Italian immigrants, said. 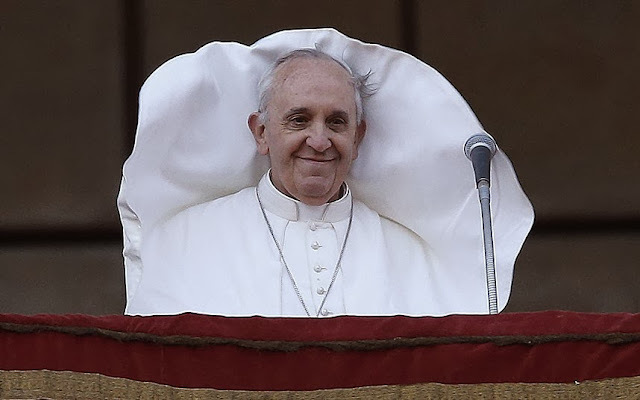 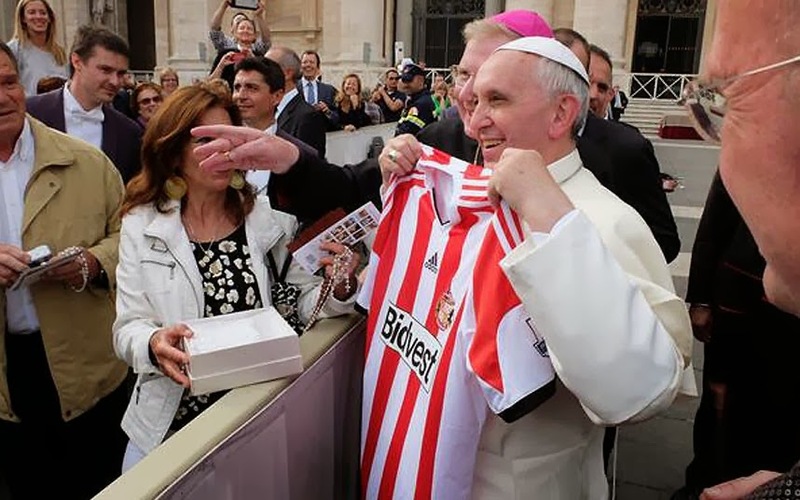 Pope Francis lifts a Sunderland shirt to his chest and poses for pictures. The shirt - which has the name Papa Francesco on the back - was taken to Rome by Sunderland club chaplain Father Marc Layden-Smith. 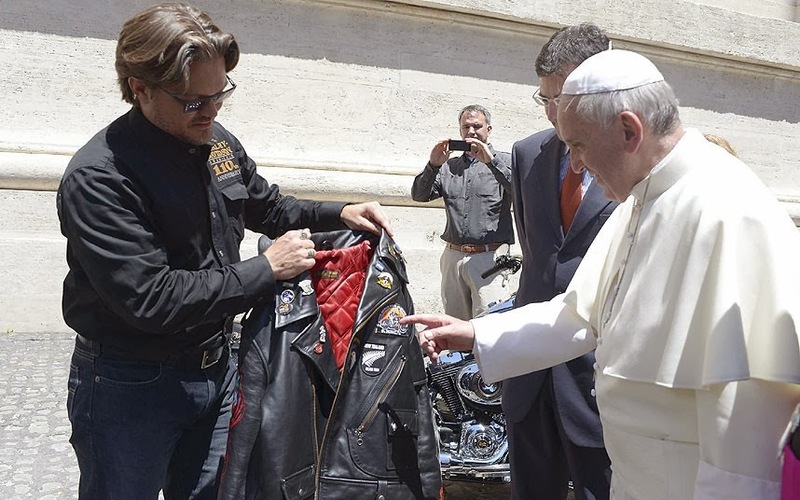 Pope Francis is presented with a leather Harley Davidson jacket during the weekly audience in Saint Peter's Square at the Vatican. Pope Francis kissing the feet of a young offender after washing them during a mass at the church of the Casal del Marmo youth prison on the outskirts of Rome as part of Holy Thursday. 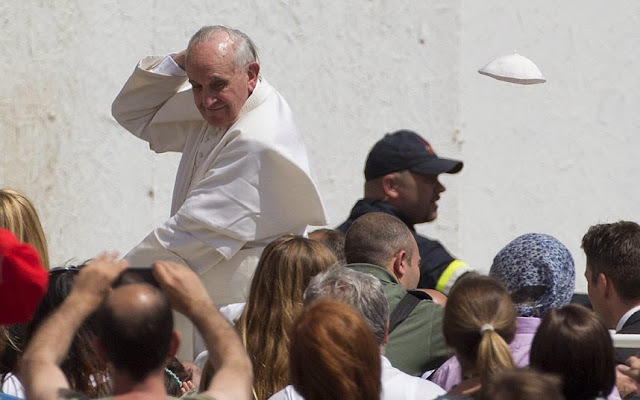 Pope Francis washed the feet of 12 young offenders including two girls at a Rome prison on Thursday in an unprecedented version of an ancient Easter ritual seen as part of an effort by the new pope to bring the Catholic Church closer to the needy. 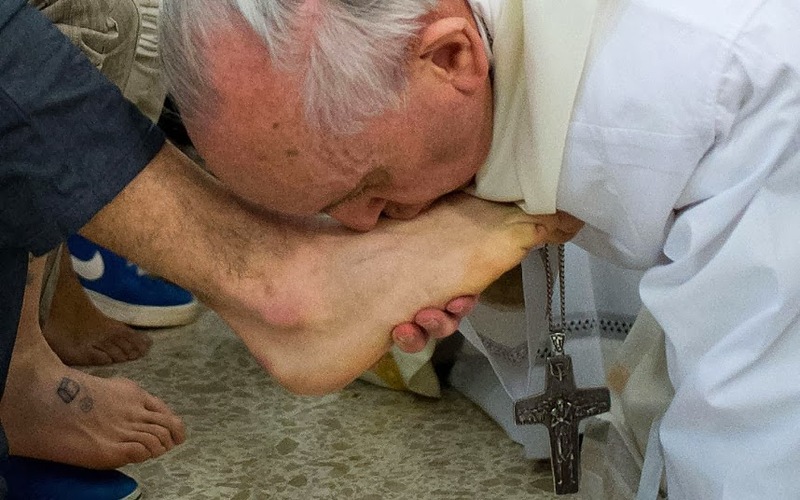 Pope Francis washes the foot of an inmate at the juvenile detention center of Casal del Marmo, Rome. 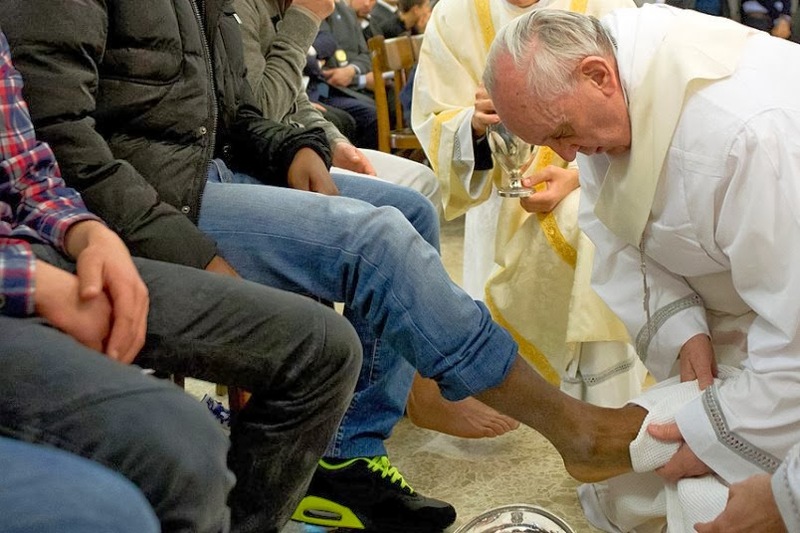 Francis washed the feet of a dozen inmates at a juvenile detention center in a Holy Thursday ritual that he celebrated for years as archbishop and is continuing now that he is pope. 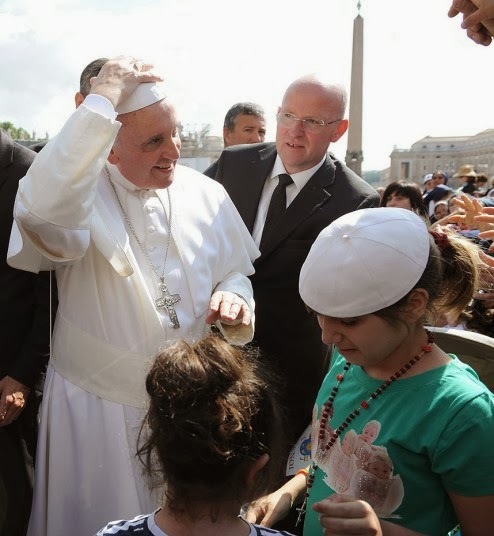 Two of the 12 were young women, an unusual choice given that the rite re-enacts Jesus' washing of the feet of his male disciples. 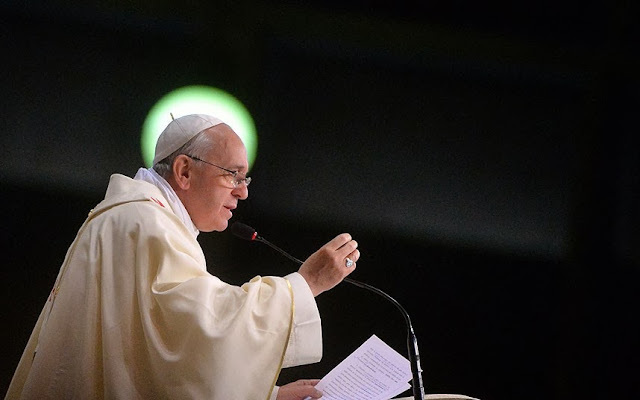 The Mass was held in the Casal del Marmo facility in Rome, where 46 young men and women currently are detained. 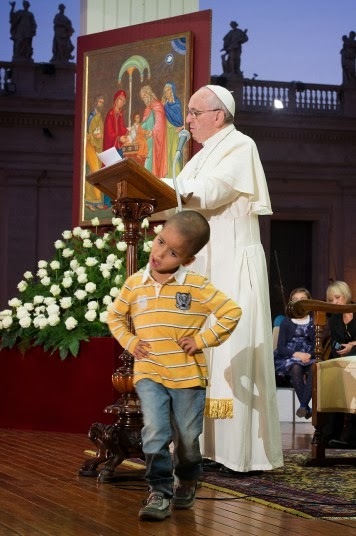 Many of them are Gypsies or North African migrants, and the Vatican said the 12 selected for the rite weren't necessarily Catholic. 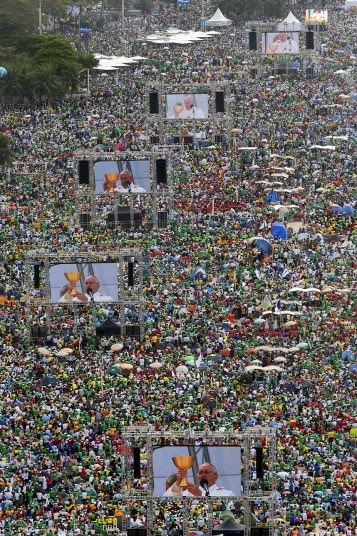 Hundreds of thousands of people crowd Copacabana beach in Rio de Janeiro as Pope Francis (on screens) celebrates the final mass of his visit to Brazil. 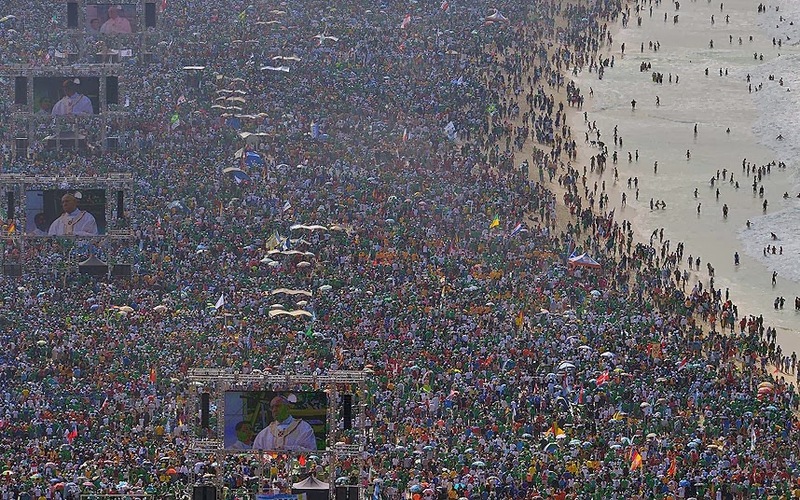 Throngs of pilgrims attending World Youth Day (WYD) spent the night sleeping on the beach before Sunday's final mass, while the city's mayor said he expects up to three million people to pack the beach for the occasion. 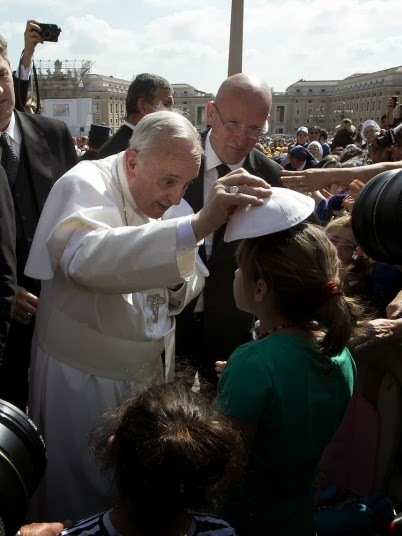 Pope Francis blessing children as he leaves at the end of a mass at St Peter's square as part of the Palm Sunday celebration on March 24, 2013 at the Vatican. 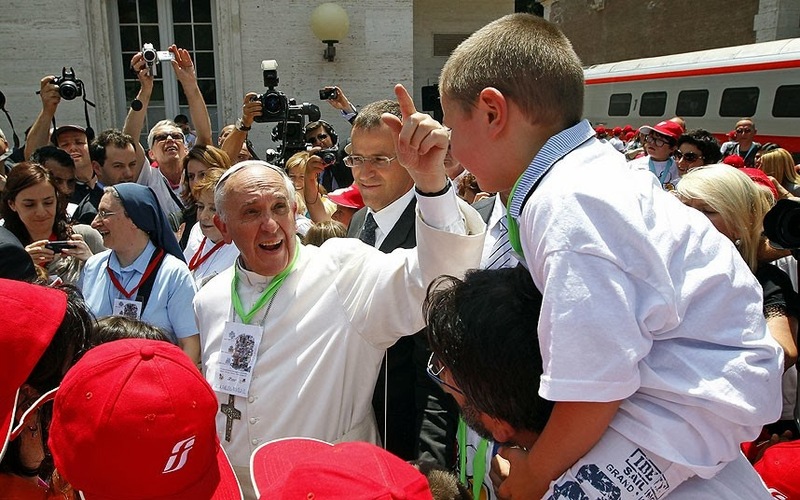 Pope Francis welcomes more than 250 children, who travelled on a special train from Milan to meet him, at the St. Peter train station in the Vatican June 23, 2013. 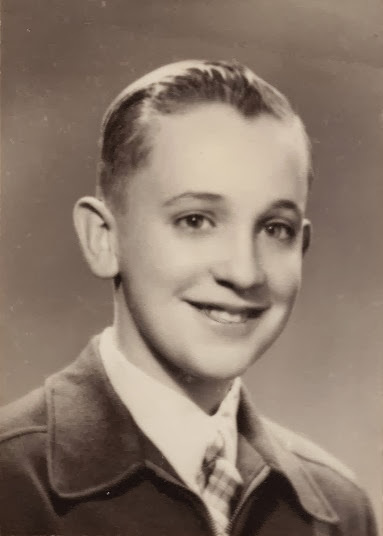 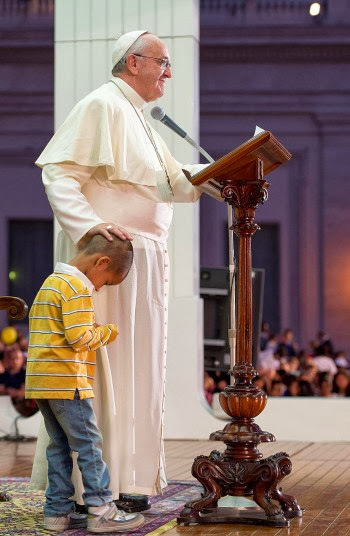 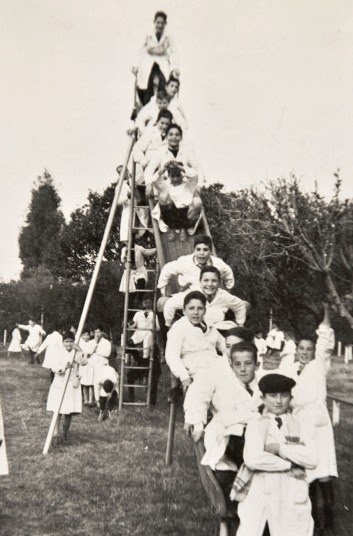 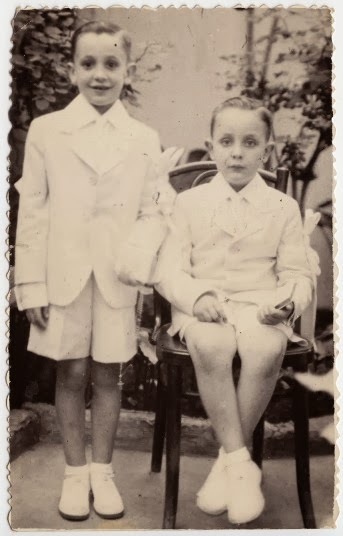 The unidentified boy refused to leave the Pope's side, clinging to his legs while two Cardinals tried to encourage him to sit back down with sweets. A gust of wind blows the Pope's Francis mantle as he stands at the balcony of St. John's in Lateran basilica after celebrating a solemn mass in Rome April 7, 2013. 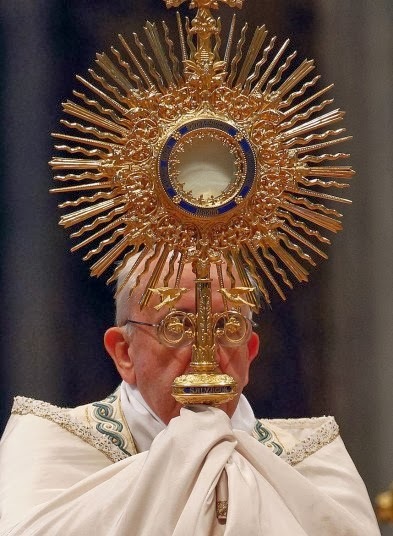 The pontiff officially took possession of the basilica which is his cathedral in his capacity as bishop of Rome. 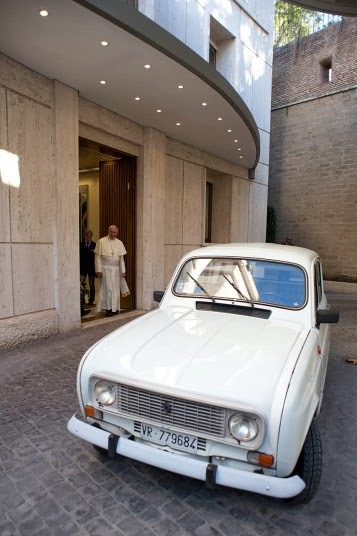 Pope Francis stumbles as he prepares to greet cardinals in Sala Clementina, at the Vatican. 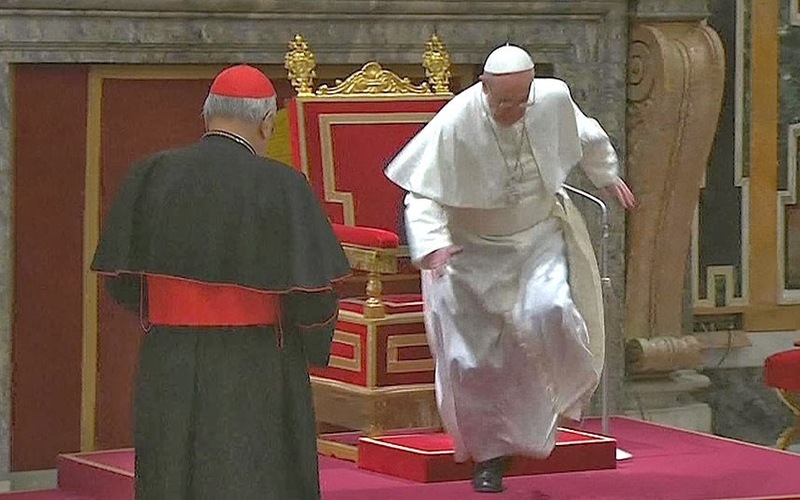 The newly appointed Pope Francis stumbled after being introduced to the College of Cardinals, but did not fall and quickly recovered. 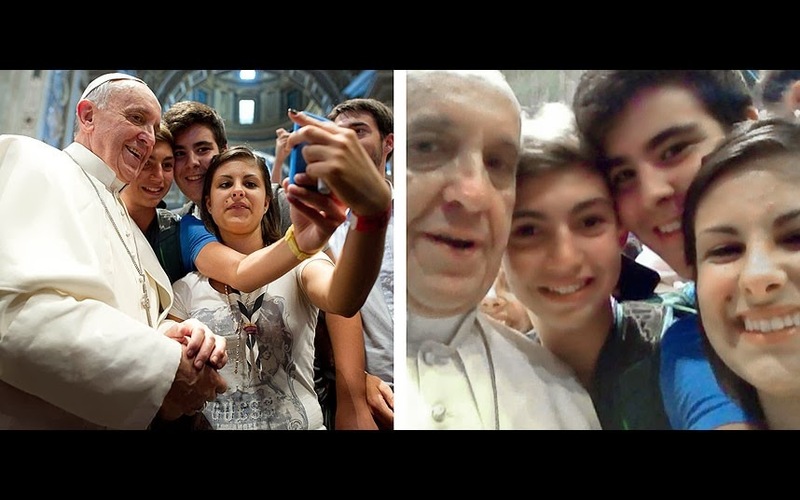 Pope Francis has his picture taken inside St. Peter's Basilica with youths from the Italian Diocese of Piacenza and Bobbio who came to Rome for a pilgrimage at the Vatican.